One of the many things I enjoyed about the Resolution Foundation meeting I talked about here was meeting for the first time people who I have long enjoyed reading, including fellow bloggers Frances Coppola and Steven Toft (Flip Chart Rick), recent blogger Giles Wilkes and Guardian journalist Polly Toynbee. On the day of the meeting Polly Toynbee wrote a nice column on the attempts by the right wing press to portray Labour as elitist and/or too intellectual and therefore ‘out of touch’ with the concerns of ordinary people. That column has a sentence that is so apt I’ll save it for the end of this post. Readers from the US will be all too familiar with this tactic, from the Gore-Bush campaign for example. A closely related ploy is to argue that politicians who are not poor who advocate policies to help the poor are somehow hypocrites (which of course tells us a great deal about the ethics of those making that accusation). Of course attempts to use background, income or character as evidence against a politician are not unique to the right. Arguments that because Cameron and much of his circle went to Eton and therefore cannot represent ordinary people are no better. No evidence is presented that Miliband does not “really understand the lower middle class or material aspiration”. That can only make sense if it follows from him being “an old-style Hampstead socialist”. There is no real difference between this and the articles in the right wing press about which Polly Toynbee rightly complains. Of course left and right are not symmetrical in one important sense: power. The right control the media spotlight, and it is focused on Miliband, such that every misfortune - self inflicted (HT Tim Harford) or otherwise - becomes a reflection on Miliband’s character. So the SNP’s popularity, and the likely loss of Labour seats there, is all down to Labour's Westminster elitism, and nothing to do with a resurgence of Scottish nationalism which in turn is a reaction against the current UK government. Voter defections from Labour to UKIP are put down to an alleged Hampstead/Islington intellectual tone: never mind that we have a governing party actually falling apart over an issue crucial to the future of the country. A tweet of a house festooned with English flags is further evidence of an alleged contempt for the working class, while employing someone at the centre of government who was subsequently jailed for being part of routine phone hacking is apparently not a reflection of anything. In this situation, is it any wonder Miliband has bad personal poll ratings. It has ever been thus. Neil Kinnock, an eloquent and passionate speaker with eminent working class credentials became at the hands of the media a “Welsh windbag” who did not have the gravitas of a prime minister. The only recent Labour leader not savaged by the press was Tony Blair, but only because Blair deliberately cultivated Murdoch, and had policies that were (designed to be?) not threatening to the establishment of which the press are a part, and who was famously relaxed about inequality and the growing wealth of the 1%. But I digress. According to polls, our two most popular political leaders at the moment are Boris Johnson and Nigel Farage. Emmott argues that their popularity comes from the same source as with Berlusconi: they raise a smile, and no one looks too deeply at their mistakes, flip flops or even lies. What Emmott does not explore explicitly is why they are able to get away with things that would sink other politicians. With Berlusconi the answer appeared straightforward - he owned a large part of the media. But what Emmott is suggesting is that maybe ownership is not crucial: if the media are prepared to give a leader as easy ride because they are amusing and charming, we may end up with the same result. You might think this could not happen here - the moment that either Johnson or Farage get close to power the attitude of the media would become more critical. That seems naive - how close do they need to get? The focus of some parts of the media on background and individual character seems to me part of the same trend, and it is not going to change before the election. We already have a media environment where something like a tweet of a house gets more media coverage than the impact of welfare reforms in driving many to rely on food banks to survive, or worse. It is an environment where on the day that Scotland is devolved substantial new powers, Channel 4 news chooses to lead on what an ex-cabinet minister might have said to a policeman in the heat of the moment. Those in the parts of the media that do not have to follow a political line, but who make decisions about what is newsworthy and what is not, need to reflect on what the impact of these decisions might be. When those who voted Labour in 2010 were asked by YouGov whether Miliband would be up to the job of Prime Minister, 54% said yes in early October, but only 34% said so in early November. Did that one month reveal some serious flaw in his abilities as a future Prime Minister, or did his poll ratings fall because the media were incessantly talking about his poor ratings! These ratings are a convenient (because they are endogenous) device to keep the spotlight focused on him. The same YouGov poll suggests voters would be no more likely to vote Labour if Yvette Cooper or Ed Balls were leader, so the idea that Miliband is a huge impediment holding Labour back seems fanciful. Paul Krugman says Keynes is slowly winning. Tyler Cowen says no, there is lots of evidence Keynes is still losing. If this strikes you as slightly juvenile, I don’t blame you. Squabbling over the relevance of some guy who died nearly 70 years ago does make the academic discipline of macroeconomics seem rather pathetic. Now, as you probably know, I’m not a neutral bystander in this debate. However I have always thought it important to try and understand where the other side is coming from. Leaving aside the debating points, what deep down is the core of the other side’s beliefs? But before addressing that, we need to be clear what we are arguing about. Let me single out three Keynesian propositions. 1) Aggregate demand matters, at least in the short term and in some circumstances (see 2) maybe longer. 3) At least some forms of fiscal policy changes will impact on aggregate demand, and therefore (given 1), on output and employment. Because the liquidity trap matters, when interest rates are at their zero lower bound we should use fiscal policy as a stimulus tool, and we should not embark on fiscal austerity unless we have no other choice. If propositions (1) and (2) strike you as self evidently correct, you might accuse me of drawing the lines in this debate in a biased way. I would of course agree that they are correct, but I would also note that there are large numbers of academic macroeconomists (don’t ask me how many) who dispute one or both of these ideas. Tyler Cowen in the post cited above talks about a ‘so-called’ liquidity trap in the context of the UK. Many macroeconomists - particularly those involved in analysing monetary policy - did think as recently as ten years ago that there was a broad academic consensus behind both (1) and (2). I was one of them. There was talk of the new neoclassical synthesis (pdf). This idea that there was such a consensus fell apart when a number of prominent academics objected to governments using fiscal stimulus in 2009. This suggests (3) is at the heart of the dispute. However my reason for including (1) and (2) is that if you accept these two points, point (3) follows pretty automatically. I was careful in formulating (3) not to claim that fiscal policy should become the only or main stimulus tool: exactly what role it should play alongside Quantitative Easing or other forms of ‘unconventional’ monetary policy - including those analysed by Keynesian macroeconomists - remains unclear and can be reasonably debated. As I have noted before, the two sides are not symmetrical on this point: while most Keynesians are happy for central banks to undertake various forms of unconventional monetary policy, the aversion on the other side to using fiscal policy seems more absolute. It is here that I have a difficulty. It seems to me in a mature, ideology free science we would be discussing - when in a liquidity trap - the relative merits of alternative forms of monetary and fiscal stimulus. It would also be generally agreed that, given the uncertainties involved with all forms of unconventional monetary policy, now was not the time to undertake austerity. But that is not the discussion we are having. Why not? An easy answer is that it is all political or ideological. Just as politicians can use fears about debt as a means of reducing the size of the state, so antagonism against fiscal stimulus comes from the same source, or an ideological aversion to state intervention. That in my view would be a sad conclusion to draw, but it may be naive to pretend otherwise. As Mark Thoma often says, the problem is with macroeconomists rather than macroeconomics. I can think of two alternative explanations that might at least apply to some anti-Keynesians. The first comes from thinking about the importance of money to macroeconomics. Money is very important, and indeed you could reasonably argue that the existence of money is critical to point (1) above. The mistake - in my view - is to therefore feel that monetary policy has to be the right way to stabilise the economy. It makes you want to believe that (2) is not true. This seems to me to have nothing to do with ideology. The second is historical. I suspect we would not even think of questioning the central role of Keynesian ideas for macroeconomics today if it had not been for the New Classical revolution in the 1970/80s. This revolution was successful in the sense that it did change the way academic macroeconomics was done (microfoundations and DSGE models). Most academic macroeconomists - for better or worse - are deeply committed to that change. But the revolution was opposed by many in the Keynesian consensus of that time, and so Keynesian economics became associated with the old fashioned way of doing things. This association was encouraged by many of the key revolutionaries themselves. We now know, as a result of the development of New Keynesian economics, that there is no necessary incompatibility between the microfoundations approach and Keynesian ideas. However I suspect that, at least for some, the association of fiscal policy with old-fashioned Keynesian ideas set down deep roots. It certainly seems that some notable academics were surprised that New Keynesian models actually provided strong support for the use of countercyclical fiscal policy in a liquidity trap. I should really stop there, but having started with Tyler Cowen’s post, I really should say something about his comments on the UK. The basic facts are very simple. We had significant fiscal contraction in financial years 2010/11 and 2011/12, which then stopped or at least slowed significantly. 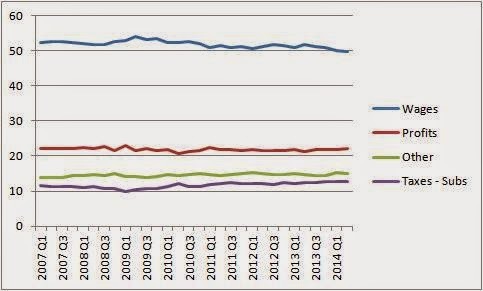 The UK recovery was erratic from 2010 to 2012, and only reached a steady pace in 2013. That is entirely consistent with the importance of fiscal policy in a liquidity trap. (The OBR calculate that austerity reduced GDP growth by 1% in 2010/11, and by 1% in 2011/12, with little impact thereafter.) Quite why the obvious fact that other things besides fiscal policy are important in explaining growth in any year is thought to be an anti-Keynesian point I cannot see. And if the case against Keynesian ideas rests on the incorrect forecast once made by a prominent Keynesian then this is really scraping the barrel. Yesterday I spoke at the Resolution Foundation’s launch of their analysis of the UK political parties’ fiscal plans post 2015. I believe this analysis shows two things very clearly. First, there is potentially a large gap between the amount of austerity planned by the two major parties. Second, George Osborne’s plans are scarcely credible. They represent a shrinking of the UK state that is unprecedented and which in my view virtually no one wants. I would add one other charge - Osborne's plans are illiterate in macroeconomic terms. The UK economy desperately needs more growth. There remains plenty of slack in the labour market, and real wages are continuing to fall. This and the inflation numbers tell us that the problem comes from the demand side. Yet monetary policy can do very little about this lack of demand, because interest rates are at their lower bound and - judging the Bank’s actions - the power of QE is largely spent. This is not a short term problem that is sure to disappear in a year. The risks that world developments will make the problem worse are real - as David Cameron has recently warned. In this situation a Chancellor should not plan to reduce growth further. I have yet to come across a single macroeconomist who argues that Osborne’s plans for renewed austerity will not in themselves reduce aggregate demand. So doing this when the recovery could go much further but is still fragile is just plain dumb. It is even dumber if you have done this once before, in a very similar situation, and the risks I outlined above have indeed materialised. So why is the Chancellor proposing to make the same mistake twice? My problem is that I cannot come up with a coherent macroeconomic explanation that fits his words and deeds. So let me list three possible justifications and why each fails. This is a plausible excuse for austerity in 2010, because of what was happening in the Eurozone, but as an IMF evaluation has recently acknowledged, the Eurozone was a false alarm which shifted policy in the wrong direction. There never was a ‘clear and present danger’ that the UK might become like Greece, and there certainly is not that danger now. The Chancellor must know full well that a more modest pace of debt reduction from 2015 will not lead to any market panic. It might lead to higher long term interest rates, but that will only be because the markets expect additional growth from less fiscal contraction (and therefore an earlier tightening of monetary policy), and that would be a good thing. There is no way markets will react to a more modest pace of debt reduction by starting to think the UK will default! He should know this because he allowed a more modest pace of debt reduction from 2012 (see below), and the markets did not blink an eyelid. Some say we must reduce debt before the next major crisis. I agree, but the time to reduce debt is when monetary policy can offset the impact of fiscal contraction on demand. It would be a far greater disaster if the next crisis came with interest rates still near their lower bound, and when the recovery was incomplete, so the number one priority is growth, whatever risks you want to avoid. 2) If debt reduction reduces growth, the Bank of England will do whatever is necessary to put things right. Once again, this argument had some supporters in 2010, partly because the Bank appeared much too optimistic about the extent to which QE could become a substitute for lower interest rates. Today most are a little wiser. In theory, it might (and I stress might) be possible to replace lower rates by QE this way, but QE is now a riskier policy, because we know so little about its impact. So even if the Bank and Fed were still expanding QE, they cannot know what effect it might have compared to cutting interest rates. However neither central bank is expanding QE, even though inflation is well below target and likely to remain so for some time. That suggests they believe the impact of this policy is largely spent, or that additional expansion might do more harm than good. Monetary policy has its limits, and it is a shame that more central bankers do not admit the fiscal policy implications of this. But what is clear is that no Chancellor today would assume that monetary policy is not constrained by interest rates at their lower bound. 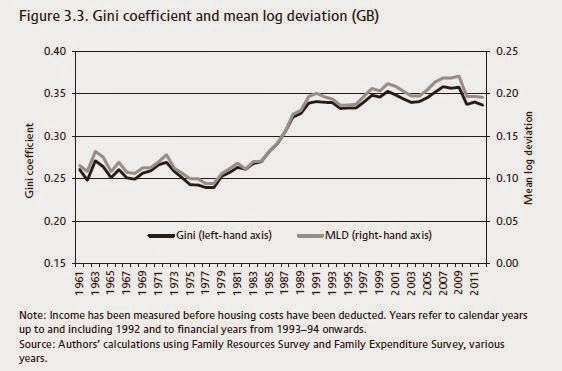 The pace of austerity clearly changed in 2012. It does not matter in this context why this happened. If the Chancellor thought getting debt down quickly was all important to promoting growth, he should have changed policy to bring deficit reduction back on track in 2012. To most economists it is obvious why he did not do that - because additional austerity would have hurt growth. But if the Chancellor believed fiscal contraction was expansionary, the opposite logic would apply. In this chart there are three horizontal lines. ‘Sustainability’ is the level of the deficit that is consistent with maintaining a 80% debt to GDP ratio, assuming nominal GDP growth of 4%. 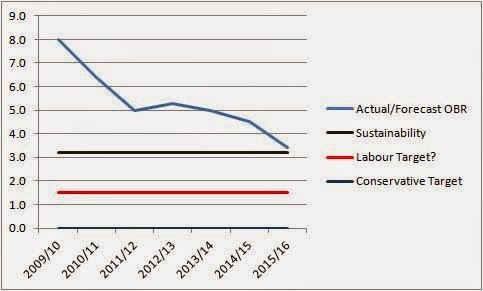 The Labour target line assumes public investment will be 1.5% of GDP. 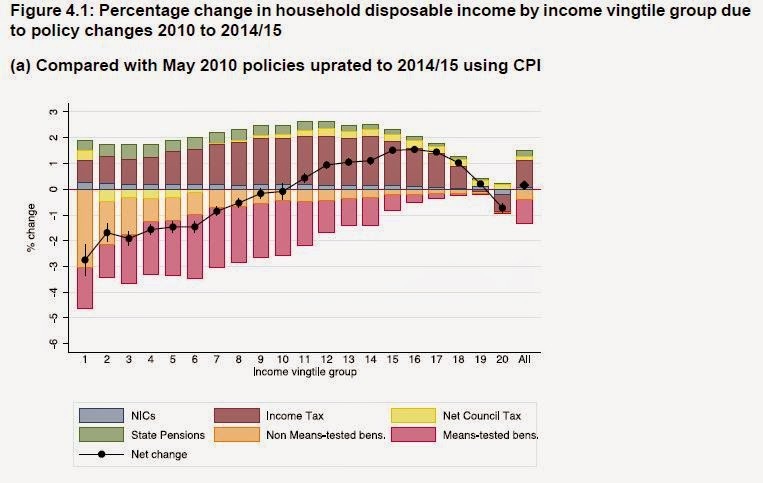 This chart probably underestimates the gap between the austerity implications of Labour and Conservative plans, because the former might be achieved later than the latter, and because the latter also involve substantial tax cuts. For a much more detailed and independent evaluation of the different parties' plans, read the Resolution Foundation's study. The title of one of my recent posts was a bit of a cheat. It was meant to surprise, because it contradicted the prevailing view, but the post didn’t actually try to answer the question the title posed. This post does try to assess whether a political party’s place on the left-right spectrum might influence its macroeconomic competence. It should be obvious that, for any individual country, looking at some macro outcome (like growth) and drawing some conclusion can be meaningless. For example, growth under Republican presidents has been far worse than under Democratic presidents, but that could so easily be down to luck rather than judgement. To make headway we need to think of mechanisms and particular instances when they applied. In the US, for example, there is a belief on the right that cutting taxes will increase tax revenue, a belief that is also clearly wrong. So you would expect Republican administrations that acted on that belief to run up bigger budget deficits than their Democratic counterparts, and that seems to be what they do. That may not be the whole story, but at least it is a mechanism that seems to fit. However it seems like a story that is rather specific to the US, at least for the moment. Just now you could argue that parties of the right are more prone to austerity, because they want a smaller state than those of the left, and austerity can be used as a cover to undertake policies that reduce the size of the state. In a situation where interest rates are stuck at zero that has the damaging macroeconomic consequences that we are seeing today. However this is a story that is specific to liquidity traps. An alternative source could be different views about the relative costs of inflation and unemployment. You might expect governments of the left to have higher inflation and those of the right to have higher unemployment. While that mechanism loses much of its force when you have independent central banks, it can resurface in a liquidity trap. A final left/right difference that might impact on macroeconomic outcomes is different views on the need for state intervention. Those on the right might favour less intervention, leading them to favour simple rules, and to argue against the use of fiscal policy for macroeconomic stabilisation. The period starts with Margaret Thatcher and the brief experiment with monetarism. Here you could use the inflation/unemployment contrast - the policy succeeded in getting inflation down very rapidly, but at high costs in terms of unemployment, which persisted because of hysteresis effects. A secondary question is whether, given any particular preferences between inflation and unemployment, the policy was inefficient because it attempted to run monetary policy according to a simple rule which failed. Many at the time argued it was, because it put far too much of the burden of lost output on the traded sector, which in turn was because the policy generated Dornbusch type overshooting effects (i.e. a large appreciation in the exchange rate). The 1990 recession can also be linked to left/right influences. The rise in inflation that preceded the recession (and to some extent made it necessary) was partly down to Nigel Lawson’s tax cuts. I have been told by one insider that the key wish at the time was to cut the top rate of tax, but it was felt that to do this alone would be politically damaging, so tax cuts were made across the board. That was not the only reason for the late 80s boom - there was also the decline in the aggregate savings ratio that in my view had a great deal to do with financial deregulation - but it was a factor. The macroeconomic failure that everyone knows about from that period was the forced exit from the ERM in 1992, and that was costly because it made monetary policy too tight beforehand. Although you could say fixing the exchange rate is a simple rule that the right might prefer, that would be stretching things: ERM entry was favoured by Labour as well (although with the notable exception of Bryan Gould). According to my own and colleagues analysis at the National Institute the entry rate was too high, which might follow from a preference for low inflation, although it could just have been a choice based on poor macroeconomic analysis. Inflation targeting followed the ERM debacle, and it was augmented by central bank independence at the start of the Labour government of 1997. One major decision that, if it had gone the other way, we might be scoring as a major error would have been if the UK had joined the Euro in 2003. I have argued that the decision not to was based on an intelligent and well researched application of current academic knowledge (subsequently vindicated by additional but related problems that academics did not anticipate), rather than any left/right policy preference. Which brings us to George Osborne. I have just finished the first draft of a paper that appraises the coalition’s macroeconomic policy, and an interesting question that arises from that is why the coalition went for austerity despite the liquidity trap. While the 2010 Eurozone crisis might explain the change of mind of the minority partners in the coalition, it does not explain Conservative policy, which was against fiscal stimulus in 2009. If you look at some of Osborne’s speeches (and I’m not sure there is much else to go on), the rationale for austerity was a belief that monetary policy was sufficient to stabilise the economy, even in a liquidity trap (see the second part of this post). At the time that represented a minority view amongst macroeconomists. It could be explained in left/right terms in various ways: a dislike of additional state intervention, taking a risk that would lead to higher unemployment rather than higher inflation, or a devious way of reducing the size of the state. So we have three major UK macroeconomic policy errors: the monetarist experiment of Thatcher, ERM entry and exit (and the boom that preceded it), and current austerity. In all three cases it is possible to link these to some extent to right wing political preferences. It may be equally possible to go back further and link the increased inflation of the 1970s to a left wing dislike of unemployment, but I cannot do that from memory alone so it would require some additional work going over the detailed history of that period. However one additional point strikes me. Two of these three errors can be attributed to following a minority academic view. That monetarism was a minority academic view in the UK in the early 1980s became clear with the famous letter from 364 economists in 1981. In UK right wing mythology that episode represents the triumph of Thatcher over the academics. I have also noted that the Labour/Brown period perhaps represented a high point in the influence of academic economists within government, and the analysis behind the 2003 entry decision was an example of that. A belief that fiscal policy is not required in a liquidity trap is a minority academic view. It may seem odd to some that those on the right might be more disposed to ignore mainstream academic opinion within economics, but of course academic economics can be described as the analysis of market failure. No one looking at debate in the US would dispute that minority academic views, or a more general anti-intellectualism, finds an easier home on the right than the left at the moment. Of course you can also find anti-intellectualism on the left - see here for a recent UK example - and my distant memories of the UK in the mid 1970s suggest that during this period they might have been at least as prevalent as those on the right. What may have happened over the last few decades is that what is currently called the left has become ideology light, and therefore more receptive to academic expertise and evidence based policy. If you want to call the gradual liberalisation of financial controls that facilitated the financial crisis a macroeconomic policy error that would make four, but I do not think anyone would seriously argue that this occurred under Labour because they were more predisposed to market liberalisation than the Conservatives. There has been some recent disquiet in the UK about politicians before the election failing to offer voters a clear account of how they would achieve their fiscal plans. The Financial Times has taken the lead, but others have concurred. A point I have stressed is that each party’s aggregate fiscal plans are quite different, even though Labour in particular seems to want to hide this fact. But the complaint I want to focus on in this post is about something different - it is about failing to make it clear how plans will be achieved in terms of detailed policy changes. While I think journalists and bloggers are right to complain, I think it is even more productive to suggest what can be done about it. Politicians do what they think is most likely to get them votes. In a time of austerity, they have calculated that any bonus they might get by being transparent will be more than offset by votes they will lose from coming clean on specific cuts or tax increases. This is hardly a unique UK phenomenon - the phrase ‘magic asterisk’ comes from the US, and Paul Ryan managed to fool quite a few ‘serious people’ by deploying it before the last US election. If the factors that enter this calculation do not change, neither will the behaviour of politicians. In 1996 I wrote a paper with the title of this post. It was the first time I proposed setting up an independent fiscal institution, or fiscal council, like the OBR. One of the few examples of such a body at the time came from the Netherlands. Those who complain about lack of transparency on fiscal matters before elections should really examine what happens today in that country. There the Dutch equivalent to the OBR offers to cost the fiscal plans of any opposition party before an election. They take up this offer, because failing to do so would be seen as a clear sign that plans were not credible. The detail that the Bureau for Economic Policy Analysis (CPB) go into is extraordinary, as I noted at the beginning of this post: here (pdf) is an example. So in the Netherlands we have a situation where the fiscal plans of each party before an election are transparent, detailed and independently costed. There is no fiscal fudge. To use a bit of economics jargon, it is a political economy equilibrium which each individual party finds it too costly to depart from. In most other countries we have an alternative equilibrium that involves plenty of fiscal fudge, from which it would be too costly for any individual party to try and break. Is there something peculiar about the Netherlands that means their set-up could not work elsewhere? I have heard excuses along those lines, but none which I find convincing. So how might we get from where we are now to something like the Dutch example? Well it so happens that in the UK we have a unique opportunity if Labour forms the next government. Ed Balls recently asked the OBR to cost their post election plans, but this would involve an extension of the OBR’s current mandate, and George Osborne did not want that to happen. Of course political advantage was behind both the request and the refusal. However, given the request, if Labour forms all or part of the next government, it will be very difficult for them to reject extending the OBR’s remit in this way. Those who complain about lack of fiscal transparency should help make sure this happens. Of course the details of how the OBR might do this need to be worked out, and it may not be appropriate to do it exactly as they do in the Netherlands. But the UK also has another piece of good fortune on this front: the previous director of the Dutch fiscal council, Coen Teulings, is currently a member of the economics department at Cambridge, so is easily on hand to give advice. We should not miss this opportunity to end fiscal fudge. This is a rather long post about how one of the instruments of macroeconomic policy has been taken away, and replaced by a fetish about government deficits. It is not technical. Cue endless discussion about whether the Bank or Fed think Quantitative Easing does not work anymore, or has become too dangerous to use, or whether the target is really asymmetric - 1% is not as bad as 3%. All this is watched by a huge elephant in the room. We have a tried and tested alternative means of getting output and inflation up besides monetary policy, and that is called fiscal policy. We teach students of economics all about it - at length. But in public it has become like the family’s guilty secret that no one wants to talk about. Once upon a time (in the 1950s, 60s and 70s) governments in the US, UK and elsewhere routinely used both monetary and fiscal policy to manage the economy. Governments did not stop using fiscal policy for this end because it did not work. Instead they found, and economists generally agreed, that when exchange rates were not fixed monetary policy was a rather more practical (and probably more efficient) instrument to use. They certainly did not stop using it because it caused the rise in inflation in the 1970s. That rise in inflation was the result of oil price shocks, combined with in many countries real wage resistance by powerful trade unions, and policy misjudgements involving both monetary and fiscal policy. When, in the previous paragraph, I wrote ‘economists generally agreed’, I am talking about what could be described as the academic mainstream. However there were also two important minority groups. One, and the less influential, argued that the mainstream was wrong, and fiscal policy was better than monetary policy at stabilising demand. The other, often among those labelled monetarist, not only took the opposite view, but had a deep dislike of using fiscal policy. For example, many believed its use would be abused by politicians to increase the size of the state (and almost all in this group wanted a smaller state). For some there was the ultimate fear that politicians would run amok with their spending, which would force central banks to print money, leading to hyperinflation - we can call this fear of fiscal dominance. However, as I noted above, the rise in global inflation in the 1970s was not an example of fiscal dominance. I shall use the label ultra-monetarist for this second group: ultra, because it is not clear Friedman himself would be among this group. These minorities aside, the mainstream consensus was that monetary policy was the instrument of choice for managing demand and inflation, but that fiscal policy was always there as a backstop. So, when Japan suffered a major financial crisis and entered a liquidity trap (interest rates fell to their Zero Lower Bound (ZLB)), the government used expansionary fiscal policy as a means of moderating the recession’s impact. At the time the results seemed disappointing, but following the experience of the Great Recession Japan’s performance in the 1990s does not look so bad. The key event that would eventually change things was the creation of the Euro. For countries within the Eurozone, monetary policy was set at the union level, so to control demand within each country fiscal policy was the only instrument left. Unfortunately the influence of ultra-monetarists within Germany had always been very strong, and for various reasons the architecture of the Eurozone was heavily influenced by Germany. This architecture essentially ignored the potential use of the fiscal instrument. Instead the influence of monetarism led to what can best be described as deficit fetishism - an insistence that budget deficits should be constrained whatever the circumstances. Within the Eurozone individual governments no longer had their own central banks who could in extremis print money. The worry among the ultra-monetarists who helped design the Eurozone architecture was that some rogue union members would force fiscal dominance on the union as a whole, so they put together fiscal rules that limited the size of budget deficits. This was both unnecessary, and a mistake. It was unnecessary because the Eurozone set up a completely independent central bank, and made fiscal dominance of that Bank illegal. It was a mistake because it completely ignored the issue of demand stabilisation for countries within the Eurozone - in practice it either took away the fiscal instrument (in a recession) or discouraged its use (in a boom ). While the design of the Eurozone reflected the obsessions of ultra-monetarists within Germany, in the rest of the world the academic mainstream prevailed. So when the financial crisis hit, and interest rates fell to the ZLB across the globe, governments in the UK and US again used fiscal stimulus as a backup instrument to moderate the recession. The IMF, normally advocates of fiscal rectitude, concurred. The policy worked. But two groups were not happy. The ultra-monetarists of course, but also many politicians on the right, whose main aim was to see a smaller state, and who saw deficit reduction as a means to achieve that goal. Both groups began to warn of the dangers of rising government debt, which was rising mainly because of the recession, but also because of fiscal stimulus where that had been enacted. What happened next was that the Eurozone struck back, although not in a calculated way. It turned out that it did contain just the kind of rogue state the architects had worried about: Greece. The fiscal rules failed to prevent excessive Greek government borrowing. Did this lead to fiscal dominance and hyperinflation in the Eurozone? - of course not, for reasons I have already given. But it did lead governments in the Eurozone to make a fatal mistake. What should have happened, and always does happen to governments that borrow too much in a currency they cannot print, is that Greece should have immediately defaulted on its debt. But instead Greece was initially encouraged to borrow from other Eurozone governments, perhaps because some countries worried that default might lead to contagion (the market would turn on other countries), but perhaps also because default would have hit commercial banks in the larger Eurozone countries who owned this Greek debt. Eventually contagion happened anyway, and Greece was forced into partial default, although not until it had taken the poison of loans from other Eurozone countries which were conditional on crippling austerity. Equally important was the impact that Greece had on the use of fiscal policy in the rest of the world. Those ultra-monetarists and right wing politicians that had been warning of a government debt crisis used the example of the Eurozone to say that this proved them right. Many (but not all) economists in the mainstream began to believe it was time to reverse the fiscal stimulus, as did the IMF. From that point on, the idea that you could - and when monetary policy became ineffective should - use fiscal policy to stimulate the economy became lost. Even in 2009 it had been a difficult policy to sell publicly: why should government be increasing debt at a time that consumers and firms had to reduce their own debt? For those who had not done an undergraduate economics course (which included most political journalists), politicians of the right who said that governments should act like prudent housewives appeared to be talking sense. Greece and the subsequent Eurozone crisis just seemed to confirm this view. Deficit fetishism became pervasive. Of course this about turn was just what both ultra-monetarists and politicians on the right wanted. The focus on government debt had an additional advantage in certain influential quarters. What had started out as a crisis caused by inadequate regulation of the financial sector began to appear as a crisis of the government’s making, which if you worked in the financial sector which had just benefited from a massive public subsidy was a bit of a relief. You could be really cynical, and say that austerity made room for another big financial bailout when the next financial crisis hit. But those with a more objective perspective watched the years after 2010 unfold with growing concern. There were no government debt crises in the major economies outside the Eurozone - instead interest rates on government debt fell to record lows. The market appeared desperate to lend governments money. The debt crisis was confined to the Eurozone. However austerity within the Eurozone, undertaken across the board and not just in the crisis economies, did nothing to end the crisis. The crisis only ended when the ECB offered to back the debt of the crisis countries. The offer alone was enough to halt the crisis, and interest rates on periphery country debt started to fall substantially. 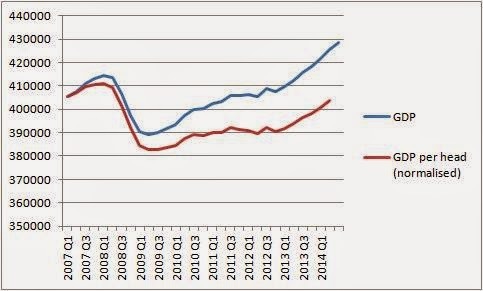 But austerity’s damage had been done, creating a second Eurozone recession. The fiscal policy instrument works, even when you use it in the wrong direction! Austerity delayed the UK’s recovery, and while growth was solid in the US, austerity there too meant that the ground lost as a result of the recession was not regained. So those with a more objective perspective, including many in the IMF, began to realise the fiscal policy reversal in 2010 had been a big mistake. The world had been unduly influenced by the rather special circumstances of the Eurozone. Furthermore within the Eurozone the crisis that austerity had meant to solve had actually been solved by the actions of the ECB. It began to look as if austerity - in perhaps a milder form - had only been required in a few periphery Eurozone countries. All this should have meant another policy switch, at least to end fiscal austerity and perhaps to return to fiscal stimulus. But deficit fetishism had taken hold. This was partly because it suited powerful political interests, but it was also because it had become the pervasive view within the media, a media that liked a simple story that ‘made sense’ to ordinary people. Politicians who appeared to deviate from the new ‘mediamacro consensus’ of deficit fetishism suffered as a consequence. So as 2014 ends, we have at best an incomplete recovery and inflation below targets, yet central banks are either not doing enough, or have given up doing anything at all. A huge amount of ink is spilt about this. But if central banks really do believe there is nothing much they can do, with a very few exceptions they fail to say the obvious, which is that it is time to use that other instrument, or at least to stop using it in the wrong direction. Perhaps they think to say this would be ‘too political’. The media in the UK and US continue to obsess about government deficits, even though it is now clear to almost everyone with any expertise that there is no chance of a government funding crisis, so the obsession is completely misplaced. Within the Eurozone deficit fetishism has achieved the status of law! There are some who say we cannot use the fiscal instrument to help the recovery, and get inflation on target, because debt will become a problem in 30 years time. It is as if a runner, who normally gets their fuel from eating carbohydrates but has run out of energy in mid-race, is denied a food with sugar (HT Peter Dorman) because a high sugar diet is bad for you in the long term. Others in the Eurozone say we must stick to the rules, because rules must be kept. But rules that create recessions with no compensating benefits are bad rules, and should be changed. Rule makers can make mistakes, and should learn from these mistakes. It is perfectly possible to design rules that both ensure long term fiscal discipline, but which do not throw away the fiscal instrument when it is needed. So every time someone writes something about what monetary policy could or should do to get inflation back to target, they should say at the outset that this goal could be achieved - in a more assured way - by a more expansionary fiscal policy. Political journalists who presume that more borrowing must be bad should get a severe telling off from their economist colleagues. For one thing that should now be clear is that rising debt since the recession has done no harm, but austerity policies that tried to tackle rising debt have done considerable damage. The 2010 Eurozone crisis was a false alarm. Macroeconomics needs to get its fiscal instrument back, and deficit fetishism has to end, but this is being prevented by an alliance between the political right, the ultra-monetarists, and I’m afraid the media itself. In the UK there is a certain irony here. 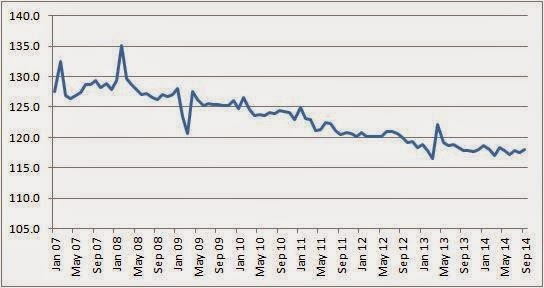 When inflation was above target in 2010-13, most of the MPC was brave enough to avoid raising rates. Although they forecast that inflation would come back to 2% within two years, this forecast was met with considerable skepticism. Three members of the MPC in 2011 voted to follow their ECB colleagues and raise rates. Perhaps as a result, the Treasury wrote a paper in 2013 which said that on occasions like that (when inflation was above target in a recession) the MPC could be a little more relaxed about the speed at which inflation returned to target. The irony is that this latitude is being used (abused?) now, when inflation is below target and we are still recovering from a recession. Maybe in the US the target is asymmetrical - but shouldn’t be - but in the UK it is symmetric by law. In a boom, when fiscal policy should have been contractionary, budget deficits were low as a result of the boom, so the rules suggested no action was required. Equally those that lent money when they should not have lent money have to accept that they made a mistake.